July 22: It has been almost a decade he has been serving the cause of wine. 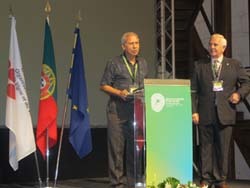 Subhash Arora, founder of Delhi Wine Club and the President of Indian Wine Academy has become the first Indian to have received the prestigious Mérite de l'OIV for his outstanding contribution in the sector of wine. He recounts his wine journey with Manisha Dasgupta of thewineclub.in, sharing a few facts about himself for the first time. TWC: One award rallying after another. You are turning out to be the face of Indian Wine! SA: That may be true but to me the encouraging and congratulatory mails that I get every day from across the world as recognition for the work that I am doing to promote wine, are equally exciting and motivational. TWC: Please tell us how you got involved with wine. Has it been a passion since your early years or you developed the taste later on? SA: Honestly, I started drinking wine as the least of the ‘evils’ much later. I grew up a teetotaler, anti-alcohol and anti-smoker. During my stay of around 7 years in Germany and USA where I did my MS and MBA after completing engineering degree at IIT Delhi, I never drank wine or any alcohol. When I came back and entered the business of international marketing, I was ‘obliged’ to imbibe some alcoholic beverage. With an aversion to beer, I chose the drink with lesser alcohol- wine; till this day I drink only wine. As I went along, I started enjoying it more and more and it became a passion and finally a mission. Of course, the studies in the 90s and this decade evidencing health benefits of wine have been in the forefront to get me involved more and more. TWC: Did you have to get yourself formally trained in wine? SA: No. When I started drinking wine, it was mostly cheap French wines from the bootleggers. Those days the Delhi wine culture was restricted to select elitists who had absolutely no clue about wines and no answers to many of my questions. As it became an intrigue, I started reading on my own. During my frequent visits to the US, I bought several books, read magazines like WS, visited several wine shops and tried to drink as much and as diverse wines as possible. Later, I started attending wine shows, visiting regions and festivals and wherever tasting was going on-asking innumerable questions unabashedly. Internet and Google were the most operative and useful tools in the learning-being in the IT industry was a help. I did consider doing WSET Diploma but they insist on Spirits tasting also and that won’t go down my throat so I never pursued the thought. TWC: When did you set up Delhi Wine Club? And what was your motivation behind setting it? SA: In 2002. I had been invited to speak at one of our Rotary club meetings, where I talked about wine before uncorking a few bottles for tasting. From the questions asked, I knew there was a latent desire to learn about wines. Incidentally, I had already introduced wines at the Rotary social get-togethers earlier. 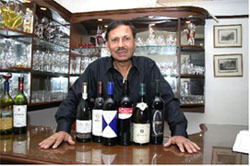 I am a member of Delhi Golf Club, so Delhi Wine Club was the natural choice for name. The objective was to get the like-minded people together so we could enjoy different wines with dinner at reasonable cost and learn about wines in an informal atmosphere and have our palates evolve as we went along. Today, after 179 events, each of which is numbered and published on the website, our members may not be able to tell the difference between grape varietals but they enjoy the experience of the evenings and can generally tell the difference between good wine and plonk. 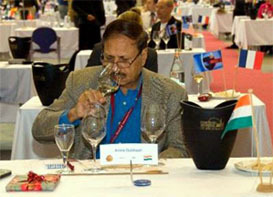 TWC: Do you think setting up Wine Clubs across metro cities in India would help the wine industry here? In what way? SA: Absolutely. When I founded DWC, there was another one in existence, though not very active. A few people wanted me to merge ours with it. My reaction was that Delhi should have at least a hundred such clubs-if not more. I feel even more strongly about it today. Most people still don’t know much about wine and are hesitant to show up as ignoramuses. The clubs give an opportunity to come together and not only enjoy wines at reasonable cost, in the right ambience but also evolve their palates and learn at their own pace in an informal atmosphere. I would insist on serving only wine-no soft or hard drinks though. This would give the producers and importers to get a feedback from the customers with different profiles. If they make special offers to such groups, not only will it increase their direct sales, they could develop a loyal fan following. TWC: What is your favourite wine? TWC: You have just received the prestigious Mérite de l’OIV. What does this award mean to you and to the Indian wine industry? SA: I would be lying if I didn’t say I felt elated with this highest recognition from a world wine body. People in India may not yet realize the importance but the other four awardees this year have been working with wine promotion for 30-40 years! Being the first and the only Indian to receive it has a special significance. But, I would be naïve not to realize that this is also recognition of the huge potential of India. This also means that the world is looking at India as an important nation both for its domestic industry and its exports but also imports into it. Unfortunately, the government has not recognized this fact yet and is still very ad-hoc and lukewarm to the industry. TWC: How did the award committee nominate you? SA: I don’t really know how it happened. I suppose someone suggested my name after perusal of my wine activities and writings during the last decade or so and the executive committee agreed. SA: Of course. They have been very supportive of my passion-especially my wife who even encouraged me to make initial wine trips abroad on my own even though it was quite expensive and hurt my business too. Later, increasing visits followed to various wine regions and events which meant staying away from the family, frequently missing events like birthdays, anniversaries and special parties. They are all very happy and proud that I am getting global recognition for my passion. TWC: Do you think that your receiving this award is going to have some impact on the echelon of policy makers? SA: I am not sure if it will but I hope they take note of the fact that India is on the radar of the wine world and there is a big opportunity that they must not miss out on. It will certainly add respectability to wine drinking and indirectly boost the wine culture. TWC: You have already been crowned with ‘Cavaliere dell ordine della Stella della Solidarita Italiana’ which in short means the Knighthood in wine. Your reaction. How these awards have changed your life? SA: First-off it is not for wine alone. The title is given by the President of Italy and is the same for everyone who is awarded, even though the reason may be different- Berlusconi has also been awarded the same title. One of the past Ambassadors of Italy in India said at a farewell dinner that DWC hosted for him (I was not knighted then) that he ‘loved’ me because I promoted Italian wines. He also said in zest that he ‘hated’ me because I promoted Chilean wines too. I corrected him and said that I promote all wines- including Indian wines. This award and others are a recognition which I cherish; they keep me motivated and charged up since I am doing it for passion and not money. When I feel like slowing down I think of them-the awards, as the responsibility that I must carry out and I am on my feet again. TWC: Recently there has been a negotiation between India and European Union which once finalized will help reduce the tariff imposed on imported wines. What is your reaction? SA: On paper- yes. But, in reality it depends upon when and how the States react in their excise taxation policy and if the Central Government can keep them in check-we have the ridiculous example of Delhi where excise duty works out more than customs duty. They should not think of wine as a cash cow and keep on taxing as they please. The EU would do well to make an agreement under which a total reduced tax is agreed upon. I am not too optimistic on that happening, though. But so far, it’s the pressures put by WTO, EU and US that have helped bring the taxes down to at least the current levels. TWC: If we ask you to prescribe three immediate steps that could improve the scenario of the Indian wine industry, what would they be? SA: Restaurants should promote wine with food, with enticing offers always on hand (and please make your prices more reasonable sticking to the capped 250% profit margin!). Wine by the glass or even an offer of a complimentary glass of wine with meal in conjunction with the supplier should be encouraged. Government needs to reduce taxes and ease on the draconic procedures, of course, but it must treat wine at a different platform than liquor. There should be a focus on wine tasting events like wine festivals, and tastings as a means of education. TWC: What is your message to Indian wine lovers? SA: Drink good quality wines- and drink moderately and regularly; 2 to 3 glasses a day for men and 1 to 2 glasses a day for women-it’s good for health. Drink what you like but form an opinion after tasting around 100 different wines. Don’t drink too much and drive-beyond the couple of glasses the bad effects of alcohol kick in. That's way the besetest answer so far!